Running a football blog for a passion is fine, but like the beautiful game itself, you may decide you want to actually get rewarded for your words. In this part I’ll talk about the often mentioned, never achieved area of blogging – monetisation. Missed the first three sections on how to run a football blog? You can read Part 1 (setup) here, Part 2 (writing) here & Part 2 (promotion) here. It is very hard to monetise a football blog! You’re Supposed To Be At Home makes me around £10 a month. I think that is quite a lot for a football blog! You won’t become a millionaire writing a football blog (or, rather, it may be tough), but you could earn some pocket money. Affiliate Schemes are probably the easiest to set up (and in some cases, the most profitable). Affiliate programmes rely on you on selling something to your visitors, and you will get a commission. Commission can vary wildly. They are the main three niches, however I’ll show you how to set you up with two of the main ones that you can use on any blog: Amazon & eBay. Visit a product you like and click on “Link to this Page”. Select the method of linking you’d prefer and copy and paste the HTML into WordPress (you may need to switch to HTML view – alternatively, copy the “Preview” and paste it into the rich text editor). When published, you should get a link like this – Changing Ends: A Season in Non League Football. Should anybody click on that link and buy, then you get a portion of the sales. Usually it’s paid out after £25. 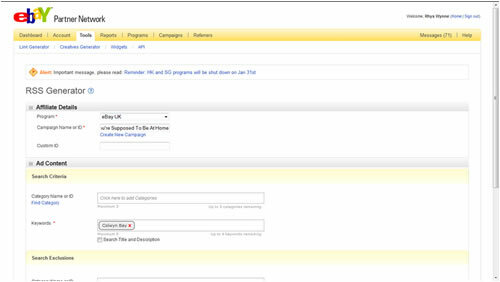 Find a programme to use, create a campaign for your site, and the select keywords to search for. For this example I am doing a search for “Stoke City Shirt”. Click “Generate RSS Link” and an RSS link will be generated. Copy the RSS Feed URL. You can sell advertising space on your site. This is handy when you are beginning to get traffic to your site. You may need to do a bit of legwork to get it started – approaching companies for advertising, alternatively you can go through a broker, who will take a portion of the sale fee. There are two main types of advertising you can sell. Banner Advertising is space for pictures and banners on the site. They are designed to create brand awareness and also to attract clicks. Although they dropped off significantly recently, they are experience a bit of resurgence. This advert is a lot more subtle and a lot more popular, though not without its risks. Basically, a text link advert is a link to a website with an specific anchor text – such as for this site it’d be Football Blog. Why are they done? Well, Google uses anchor text links from strong sites as a sign of quality, pushing sites up the rankings. People aren’t buying links on your site in the hope that somebody clicks them, they are buying them for the juice Google passes on. It can be quite profitable, but risky. If Google does find out you are selling links, then you could be dropped for search engines. I don’t worry too much about search engine rankings, so don’t mind selling them, but yes, don’t say I didn’t warn you! For advertising and managing advertising, I use OIO Publisher. The WordPress Plugin (which is paid for) allows you to rotate banner ads, take payments, run subscriptions and generally manage your site’s advertising real estate. It also has a “Marketplace”, which is a sort of broker, but it doesn’t take a percentage. So simple yet so useful. One way to make a fair bit of money a little easier with an audience is something that I’ve done before, yet not tried on this blog, is sell your own products. It may sound scary but it can be incredibly rewarding – there is no nicer feeling than going to bed and waking up richer than when you went to bed (well maybe there are). Kindle Direct Publishing – good for selling eBooks direct to Kindle. 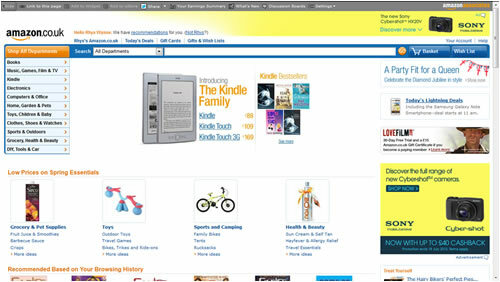 E-Junkie – Good for selling non Kindle eBooks, and other digital products. iStockPhoto – Good for selling images as stock photography. Unfortunately, I don’t know anywhere where you can sell prints of photos. If anybody recommends a service, please let me know! That concludes part 4 of this guide. Part 5 is still to come, where I talk about stepping away from the day to day running of your blog and moving into owning a blog. To follow that part, please subscribe to my newsletter below and you will get it next Friday. Thank you! In this section of my “How To Run A Football Blog” guide, I will focus on promoting and marketing your blog. Anybody who says “write great content and they will come” is a liar, as general prodding is needed, here’s some ways that football blogs could get more traffic. You can read Part 1 (setup) here & Part 2 (writing) here. By far the best tool that football bloggers have to promote their stuff is social media, and by social media, I mean “Twitter and Facebook”. Generally I find that Twitter works so much better at promoting your posts than Facebook, so when you have a twitter account, you should be promoting there first. Generally I have multiple twitter accounts. I have @ystbah which is solely dedicated to this blog as well as football tweets. I have @rhyswynne which is me swearing about things. I also have ones for my other websites I’ve made (@bloggingdojo & @retrogarden), as well as other projects or just securing the name for other projects (@WPEmailCapture). I use Tweetdeck to manage them all, which handily allows cross posting (so a post about football would probably be posted on my @rhyswynne & @ystbah account, a post about a new version of WordPress would probably be posted on @rhyswynne & @bloggingdojo), as well as notifications, and columns for searches (so you will be notified whenever somebody uses a hashtag or posts about your football club). That’s the basic of social media. I have seen people automate social media with huge successes, however for this guide I’d recommend just sitting with Twitter open in the background, interacting with the community (for example – say “hi” when you follow people! After part 1 of the guide I had 25 new followers. Not one said hi!). I am going to share a couple of things which have brought me a bit of traffic over time. From Part 1 you should’ve installed Twitter Tools. This allows (amongst other things) to tweet automatically new posts to your blog. It requires a bit of setup – you need to create an Application on Twitter.com to use this – however the plugin talks you through the process. When this is done, you want to “Enable option to create a tweet when you post in your blog?” and “Set this on by default?” to yes. Give it a prefix such as “New Blog Post” (without a colon, this is added automatically). And then get ready to post. In the blog post’s right hand sidebar before you post is a box with #hashtags. This is where you put blog posts hashtags to try and get more followers, or also twitter accounts that may be interested in your post. Be warned though, if your [Prefix] + [Post Title] + [Link] + [hashtags] go over 140 characters, your tweet won’t be posted, and you get no warning. The second promotion tip is to use a plugin called Tweet Old Posts to (surprise surprise) tweet old posts on your blog to your twitter account. After authorise your blog (a similar process to Twitter Tools), you can set up the plugin to tweet old post at random, yet regular intervals. I have mine to post a blog post every 17 hours or so. A good idea is to clearly mark these posts as being archived posts (which you can do using the “Additional Text”. That way you don’t annoy people by constantly regurgitating old content. Also, you may want to exclude certain categories (like “News”) whose content may be irrelevant if you repost it. Find Blogs You Like & Contact Them – By this time in your blogging “career”, you should have other blogs you like. Approach them and ask if you can do a piece in exchange for a couple of links, most **should** say yes. 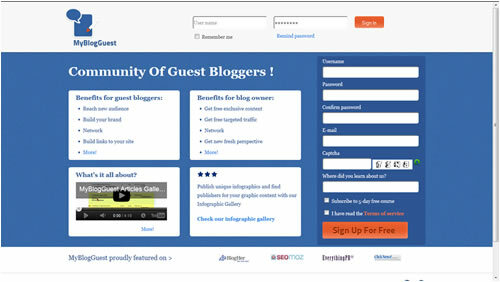 Using My Blog Guest – My Blog Guest is a community that specialises in joining blog owners (who are looking for content) and writers (who are looking for exposure). It can be a bit tricky finding a relevant blog (you’ll probably have to limit yourself to “sport” blogs), but it can expose your content to a brand new audience, away from the usual football crowd. After writing the post, you should get a publish date. On the date of publish, share amongst your followers on Twitter. See also if you can get a couple of links at the footer of your post, one to your blog and one to your twitter account. As An Aside – there are plenty of tumblr’s out there that you can get links and traffic from for just submitting a picture or a review of food at grounds! Search Engine Optimisation (SEO) is the art of driving more traffic to your site from search engines by associating your website with relevant keywords, either on page (keywords in the posts), or off page (keyword links pointing to the site). SEO in itself is largely irrelevant for blogs. Football blogs seem to always get more traffic from social media and general marketing, rather than from search engines (at least in my case). Also, SEO as a discipline is beyond the scope of this guide, but as I am an SEO by trade, I’ll cover a few basics. To begin with, you need to pick the best keywords that describe your blog. Keywords such as “football”, “football news” or “football blog” will bring in the most traffic, though a lot of the traffic will be irrelevant – if you solely write about Manchester United, for example, any Manchester City fans wouldn’t find your blog interesting. Instead drill down and think of the most relevant phrases. 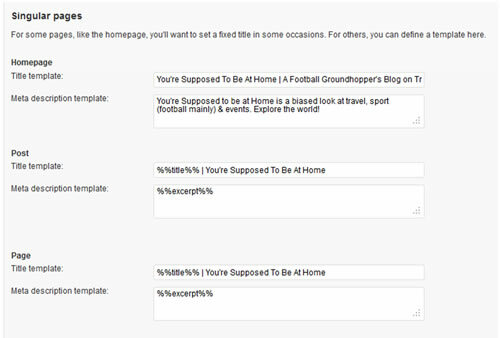 For You’re Supposed To Be at Home, I decided my main keywords were “Groundhopper Blog”, “Football”, “Sport” and “Travel” as secondary keywords (the blog will never rank for “Football”, “Sport” and “Travel”, but may rank for combinations of the terms along with Groundhopper). You want this to be a general overview of your blog, so once you have chosen your main keywords, head to the WordPress Administration, and open up SEO > Titles. In the box “Title Template” under Homepage, come up with a title. A good title will take the form of [Blog Title] | [A Short Keyword Rich Description]. Add a description as well, as this can encourage clickthroughs from search engines. Also at this point, add a post title and a page title as per the image above, as it gives a default Post and page title which is good when you forget. First things first – you shouldn’t spend time optimising every post. Some posts aren’t worth optimising, just posts you believe you can get some traffic from search engines. Posts like match reports are good to optimise, whereas rumour posts – that occur and die fairly quickly – aren’t. The first thing you should do is write your post. Never ever try and write posts for search engines as they’ll read funny 9 times out of 10. Instead write your post and then reread it, seeing if you can fit relevant keywords into places that you have used joining words (things like “it”, “them”, “they”, “he” etc.). When the post is written, you will need to change the Title Tag of that post. The title tag is often used in search engine results, as is the meta description. The post title needs to encourage clicks from social media, and to keep people reading, whereas the title tag needs to be keyword rich and relevant, so interested searchers would click on your listing in Google as they think your site will hold the information they are looking for. (I like putting a “|” followed by a blog name after the keywords, as it helps branding). To do this, on the post you have written, scroll down until you see the “WordPress SEO By Yoast” box, and in the “SEO Title” box, put in your optimised title. Publish the post. If you want to include a description as well, fill in the “Meta Description” box. This may not always be used, and doesn’t affect the rankings of your page, however a well thought out description can encourage clickthroughs. Whilst online is where you should do most of your promotion, you should also look at offline channels. The easiest way to do this is via football programmes. If you are reading this, you’re probably a football fan and support a team somewhere. That team would likely have a programme and – if you’re lucky – a number of fanzines. Many of them are struggling for content. You can quite easily reprint your articles from your blog into the programmes, but make sure you edit and include a by-line (similar to Guest Blogging), but write out any website address, rather than linking to them. A great service if you’re unable to place anything in your local programme is Non League Notes. 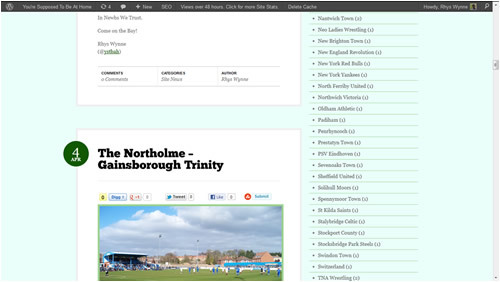 Submit a few of your articles there, and non league programme editors can use the articles for free in their programme. This will increase the reach of your blog, and hopefully, traffic. Phew bit of a long one this week! I hope that it has given a few ideas on how to promote a football blog. Any questions please let me know below. Alternatively, next week is Monetisation – if you want it in your inbox next week, sign up to the newsletter below, or join us here next Wednesday (day off due to the Jubilee). This is Part 2 on “How To Run A Football Blog”. You can read Part 1 of How To Run a Football Blog – Setup here. 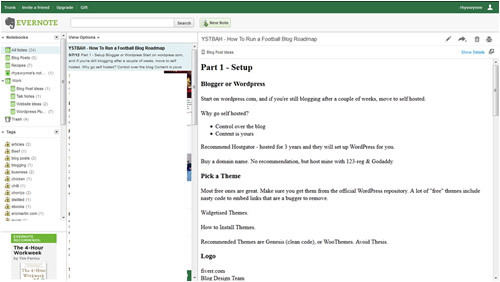 In Part 1 we looked at how to set up a football blog. In this part I will focus a little bit of design, structure and tips on writing. I’m not going to tell you how to write a football blog! Blogs appear, blogs go, blogs evolve. What you start writing about may not be what you end up settling on. Plus do you read my crap? I can hardly offer writing tips! Instead I’ll offer you an overview on site structure, adding sidebars to your blog, and methods of adding some structure to your writing. Site Structure – What To Use? With WordPress blogs you have two things that you can use to categorise blogs – Categories & Tags. Categories are a small number of headings for your blog. These headings can have sub headings, and sub headings, and sub headings of sub headings. These are very structured. Tags are quick and easy way to associate your content based on what you write about. These are a lot more fluid. The sidebar with all the teams on it are my "tags"
There should be no crossover – You shouldn’t have a category with a tag and vice versa. A good example for Football Blogs will be similar to You’re Supposed To Be At Home – have the categories be leagues or competitions, and tags being the teams mentioned. Only One Should Be Indexable By The Search Engines – by default, it is usually categories. You shouldn’t worry too much about this. Depending on the theme you choose, you may have 1, 2 or more sidebars. If you pick a good theme, they will be widgetised, which means you can drag and drop sidebar elements to change the site. 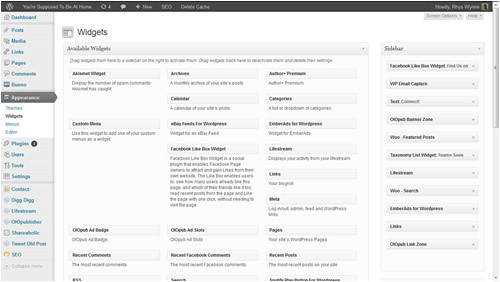 To access the sidebar widgets area, go to “Appearance>Widgets” in the WordPress Administration. 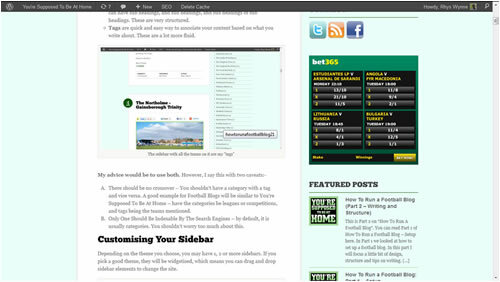 Simply drag the widgets from the left hand side of the screen into the right “Sidebar” area. A small amount of customisation may need to be done on the widget to get them right, but good widgets will talk you through this. Twitter streams – I use a modified version of Lifestream for mine, you can use what you want. WP Email Capture – To capture email addresses. Tag Clouds – They are ugly! Structuring Your Writing – Making Things A Little More Serious! You know how it is, you’re struggling to write and maintain a blog. Unfortunately, a sign of a good blog is consistent content. You shouldn’t have to write every day, however if you consistently write, people will expect it and visit your site more often. As such, to make it a little easier to structure your writing, here are some tools I recommend. 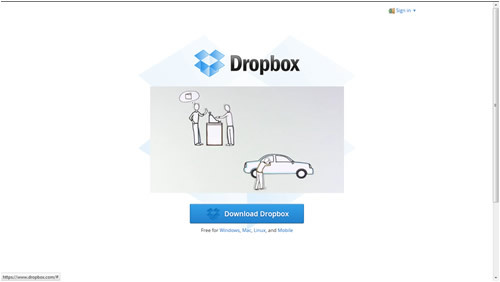 Dropbox - Lifesaver on more than one occasion! An absolute lifesaver. Dropbox gives you 4 Gigs of free space for storing data online. Use for photos, documents or whatever you use for your blog. It installs a small program on your computer in which you can drag and drop files. Install the program on any other computer, mobile or tablet device, login, and you have your files there for you. Great if you’re always switching computers, a life saver if you take a few photos. You sign up for 4 GB for free, or with the link below for extra 250 Megs for free. Paid plans available. Evernote is bloody marvellous. It is a quick and easy online note taker. I use this for everything, taking notes of ideas, copying blog posts for reading later, and clipping recipes I find out on the internet. Evernote works via a syncing system, so if you write something down on it – be it PC, iPad or phone – you don’t need to be connected to the internet: it will upload it when connected. Likewise you don’t need to be connected to read notes. It’s simple, and great. It’s free, but there are paid packages available. I’ve never needed them. Remember the Milk has seen me get more organised. In order to remember what to write when, I use Remember the Milk. This task list website syncs with my phone and tablet, and sets me reminders of what to do when. You can tag tasks, repeat tasks and generally organise your life. I use it to schedule updates for my blog, to set aside deadlines for writing (which I must admit, I’m not that strict to adhere to), and also when to carry out updates on my site. Again, a free version exists. I am on the paid version, and I love it! Although not quite as epic as last week, I hope this week has been helpful in helping you run a football blog. It’s mainly some timesavers this week, as these are important. Time is precious and you need time to do promotion of your blog. That is next week! Check back in next week for the post, or sign up to the newsletter to get it into your inbox next Friday. See you then! Hello and welcome to a new series I’ve decided to run after a little bit of coaxing from various people. This will be a 5 week course on how to run a football blog. Whilst I’m not saying I’m the greatest football blogger out there, nor am I the most profitable, I do think I at least know a wee bit on what I’m talking about. As such, this is a blueprint for new football bloggers to get a blog up and running. However, I believe there is a lot that is useful stuff in here even if you are not a new blogger! As well as running You’re Supposed To Be At Home, I pay the bills by using a mixture of my day job as head of International SEO at a small marketing firm (which sounds more impressive than it is), and run my own sites as well on the side. As such, I feel that, whilst I’m not the best writer in the world, I know a few bits and bobs on how to SEO and market a website. In writing this, I am going to suggest a few tools and services I use. First off – I use the same tools or service. I do not suggest anything that I don’t use or recommend myself. However: a few of the tools are affiliate links. As such, if you click the link and purchase: I get some cash. If you don’t like that, simply Google (or Bing, I prefer Bing!) the tools in question. They’ll turn up and I won’t get a penny. That is fine! Setting Up The Blog – What Platform To Use? There are two main platforms in which to begin blogging – WordPress and Blogger. Blogger is a service run by Google which allows a lot more for free. WordPress is a free service as well, and is open source, which means that anybody (yours truly included) can develop themes and plugins and release them onto the market. Many of the top themes and plugins are free. However, whilst the software is free, if you don’t have a domain name or hosting space, you will have to settle with WordPress.com hosting. Whilst free – WordPress.com hosting is a lot more restrictive as to what you can or cannot do on it. For the purposes of this tutorial, I would suggest signing up with WordPress.com. Pick a theme and start blogging. Also at this point, I’d suggest signing up to Twitter and interacting with the Twitter community as well. Make sure your twitter handle is as close to the name of your blog as possible. Full Control – Your hosting will allow you to control and manage the blog effectively. If WordPress.com or Blogger.com were to ever go down or change their terms and conditions, then you will be fine. You Legally Own Your Own Content – A worrying trend in Blogger.com services is that Google technically owns your content. I’m not a lawyer but reading through their terms and conditions that is what is suggested. In self hosting, you will own your content and you can do what you want with it. You Can Start Earning Money – The main drawback of free services is that you cannot earn cash for your hard work. In self hosting, you can do what you want with your hosting. Including earning some cash. You Are Perceived to be Bigger – A domain name ranges from 99p to £10 a year. I generally trust bloggers that aren’t wordpress.com or blogspot.com domains a lot more. You Are Boosted in Search Engines – Although we won’t be looking too much as search engine traffic in this guide, having a self hosted blog does boost your search engine traffic. To become self hosted, you need two things. A domain name and a hosting provider. Your domain name is the www.[something]. [something] you use to access your site on the internet. Your hosting is a computer permanently attached to the internet in which you place your files to access them (in this case, your WordPress files). All of my websites are hosted by Hostgator. This US hosting firm use great servers and are rarely down. Secondly (and more importantly) their technical support is second to none. Quick and knowledgeable, any issues I have had have been sorted within 24 hours. Most issues are solved there and then. I couldn’t recommend enough. Click here to visit Hostgator’s Website. Domain Name Registrant – Each to their Own! There are plenty of domain name registrars out there. As such, many of them are similar. However, I use a combination of 123-reg and Godaddy for my domains. 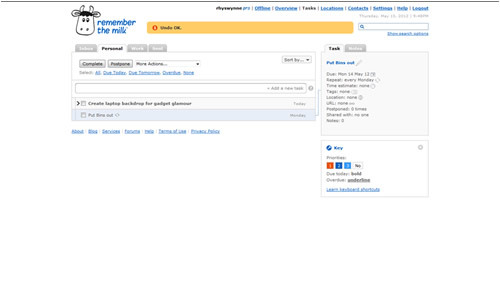 When you sign up to Hostgator you will receive login details with your username, password & your nameservers. Log into your Domain Registrar (123-reg or Godaddy), find your domain name & find the option to “change DNS” or “change nameservers”. Change the two nameservers on your registrar to the Hostgator Nameservers mentioned in sentence one. Fiverr.com – I’ve known a few bloggers to get a logo designed by fiverr.com. It’s a bit hit and miss (often I’ve known bloggers to get 4 or 5 logos designed on this, and pick the best), but if you fancy an uber-cheap way to get a logo designed by somebody other than yourself, use this. 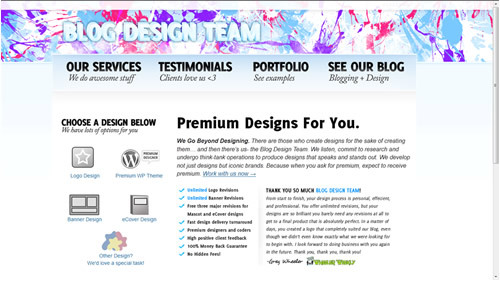 Blog Design Team – I’ve used this multiple times & recommend it. Quick, easy, simple, multiple revisions. A proper logo designed by some great graphic designers in the Philippines for less than a night out. Superb. I recommend designing a logo before picking a theme as in doing so you get an idea on what colour scheme you wish to use for your blog, and your theme. 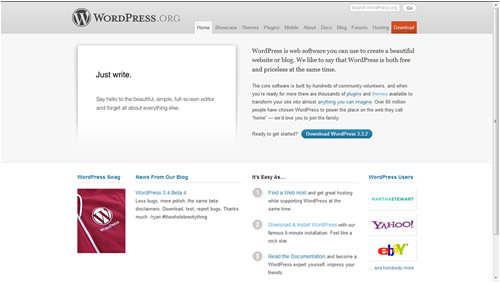 Many bloggers design their own logo and shell out for a theme. I recommend the opposite. With a little bit of searching you can find a great theme for nothing. 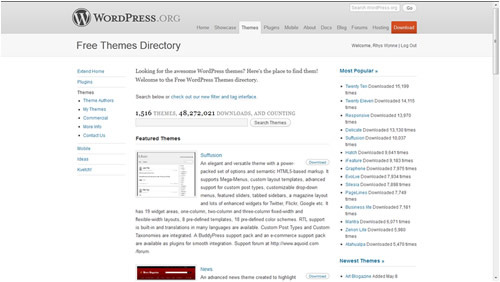 To find a theme for free, I recommend checking out the WordPress.org Theme Repository. That contains themes that are certified clean (many WordPress themes aren’t clean, read this post so you know why). There are plenty of great paid themes. However most simply aren’t worth the money. You’re more saving time rather than getting access to many new features. However two that I recommend are Genesis Theme Framework (highly recommended) and WooThemes (slightly recommended). However for most bloggers I’d stick to free themes. I would suggest you avoid Thesis. The code is bloated and much of the functionality that should be Plugin driven are theme driven. Plugins are fairly straightforward. They are ways in which you can expand WordPress’ functionality with extra features. For most blogs, you’d want a selection of these. They are easy to install and, by and large, easy to use. 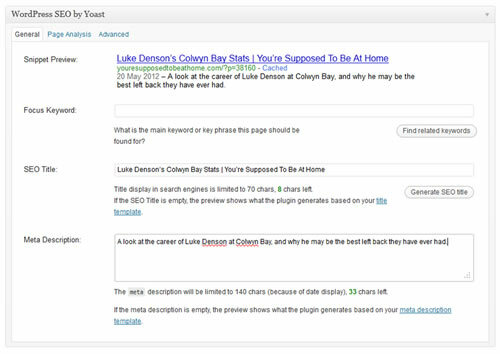 Yoast WordPress SEO – Will be discussed in this tutorial. The best plugin out there for Search Engine Optimisation. 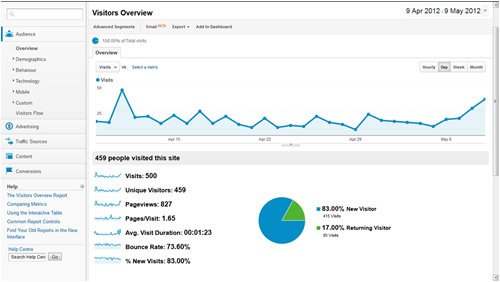 Yoast Google Analytics – Allows easy integration of Google Analytics which will be discussed later. WP Email Capture – (disclaimer, this is my plugin) Allows you to capture email addresses so you can send out newsletters (will discuss more later). Akismet – (comes pre installed). Prevents comment spam. This is a must. Twitter Tools – Allows you to automatically tweet new posts to your twitter account. Contact Form 7 ­– Allows the easy creation of a contact form. Useful for advertising enquiries/guest blog enquries. Tweet Old Post – Periodically tweets posts from the archive to your site. Good for maintaining a level of interest even when you are not able to tweet. WP Super Cache – Does some cool stuff in the back end of WordPress which means that if your site gets a lot of hits, then the speed of your site isn’t affected. Recommended, even if you aren’t sure what it does. WordPress Database Backup – Backs up your WordPress Database & emails it to you, good in case things go wrong. Digg Digg – Adds social media buttons to your posts, allows posts to be easily shared. Click on the “Admin” button located at the top right hand corner of the screen. Click “New Account” and create a new account, filling in the relevant details. Once done, click on “New Property”, give it a name, place your URL in the “Website’s URL” and then click “Create Property”. 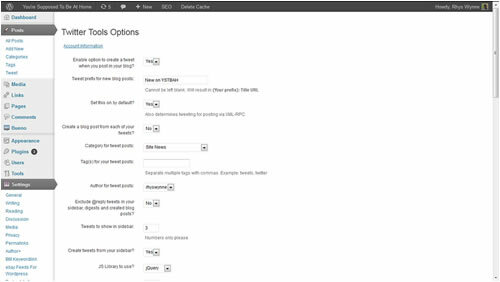 Then log into your WordPress account & go to “Settings > Google Analytics”. 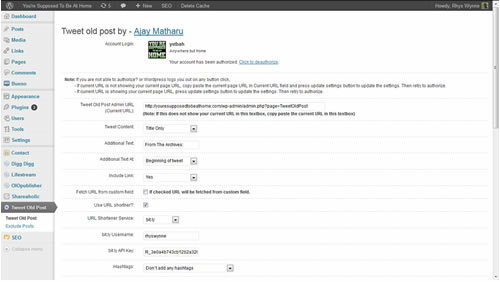 Authenticate your account with your WordPress installation, and then link your WordPress account with the correct Google Analytics account. Click “Update Google Analytics Settings” and you’re done! The next thing you must do is set yourself up with Google Webmaster Tools. This gives you an overview on how your site is performing within Google, what it thinks the main keywords for your site are. It also crucially lets you know if your site has been hacked or is distributing malicious software & will let you resubmit the site to search engines. It’s very useful in letting you know how Google sees your site. There are two ways of getting your website verified within Google Webmaster Tools. First you need to login to Google Webmaster Tools with your Google Account details you either have or created in the previous step. When you have done that, click on the “Add a Site” button to add your site to Google Webmaster Tools, put in your site URL within the box that appears and you’ll be given a choice on how you’d like to verify your site. Click “add a meta tag”. Copy the meta tag. In your WordPress Administration, click on “SEO”. At the bottom there is a box entitled “Webmaster Tools”. Paste the copied meta tag into there. Click “Save Settings”. It is important to back up your blog. Fortunately it’s easy to schedule the backups. To begin with, click on “Tools > Backup” in the WordPress Administration. Scroll down to “Schedule Backups”. Click the button next to the frequency of backups you are after (weekly is great), check all the boxes on “extra tables to backup”, and enter your email in the box above Schedule. Click Schedule and you’ll have backups set up, emailing you copies of your backup! Congratulations, you now a great blog and a platform for sharing your thoughts a bit more seriously than before. Now what to write? Well, anything you want. However in the next part I will share ways in which I get posts written, including structuring your football blog, scheduling posts and jotting down ideas at matches quickly and easily. Check back in next week for the post, or sign up to the newsletter to get it into your inbox next Friday. See you then!